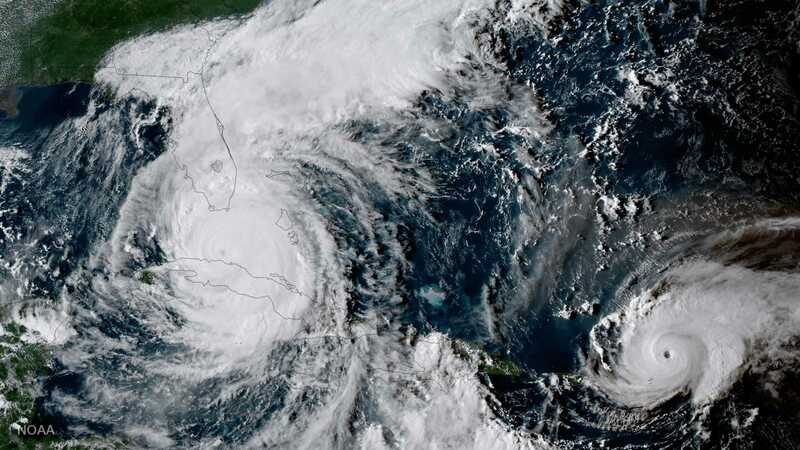 I went looking for the freshest image of Irma. NOAA posted this geocolour image of Hurricanes Irma and Jose from GOES-16 “on the evening” of September 9, 2017. Since I’m posting it about 3.00 pm Sunday, NZT, current Florida time is 11.00 pm Saturday, and evening might be, say, 6.00 pm to 9.00 pm, it sounds as though the pic was snapped up to about five hours previously. There’s almost seamless cloud over the entire peninsula, although some may have come from the north. Damaging winds are already hammering it — what’s happening under those fluffy clouds? Hurricane Jose is under a narrow zone of weak shear that appears to be moving westward in tandem with the hurricane. This should allow Jose to maintain its intensity in the short term, with gradual weakening expected thereafter. It’s still two hurricanes in short order. INTERESTING NOTE: Created by the Cooperative Institute for Research in the Atmosphere, the experimental geocolour imagery enhancement shown here displays geostationary satellite data in different ways depending on whether it is day or night.